Stretching out across the emerald green waters over 1470 Feet beyond 2 sand bars the Pensacola Beach Fishing Pier has some of the most exciting fishing and sights any pier Florida has to offer. Our pier is also the vantage point for some of the greatest sunsets on Pensacola Beach! From our pier you can watch marine life, surfing as well as fishermen and women reeling in their catch. And did we forget to say, "the most friendly pier around!" The Pensacola Beach Gulf Pier is here for everyone to enjoy and has something for everyone! Whether you are a seasoned fisherman or a beginner you will be right at home on our pier. We also have everything you need to fish, bait, tackle, rental rods, coolers and carts as well as food, drinks, tackle and gifts. In addition to the great sunsets which change throughout the season from a northern sunset to a southern hemisphere sunset we have an abundance of marine life. From our pier we see many kinds of marine life from dolphins, manatees, brown and cow rays, different types of sharks, crabs. In addition, there are many types of fish swimming around the pier as well as marine birds. Watching the activities of these species around the pier has become a favorite for some of our local schools, bird and marine life watchers which we host here at the pier. Many gulf species are caught from our pier such as King & Spanish Mackerel, Cobia, Pompano, Mahi Mahi, Flounder, Whiting, Blue Fish, Tarpon, Bonito, Red Fish just to name a few. In the winter, we catch many nice red fish and sheephead around the pier. Several Sailfish weighing 50 pounds or more has also been caught off the end of the pier when the blue water is in close. The Gulf pier also hosts and participates in many fishing tournaments so be sure to check with us to see what we have going on. This year we gave free passes to the first legal cobia and king mackerel. At the Pensacola Beach Gulf Pier, it is a local tradition to watch the awesome sunsets. At Sunset you will see many locals as well as visitors walking the pier watching the surf, marine life waiting on one of the prettiest sunsets you have seen. We have many benches located down the length of the pier for your comfort and relaxation. The Pensacola Beach Pier is also home to some very exciting establishments such as Casino Beach Bar & Grill (http://www.casinobeachbar.com/) Go Fish Gift Shop (http://gofishclothing.com/), Sophia’s Swimwear and more. At the Casino Beach Bar and Grill you will find a full bar and exciting menu of fresh food. We also have several tables shaded with umbrellas for your comfort while you eat. So, if you are visiting us at the pier, be sure to do some shopping and visit the Casino Beach Bar and Grill where we are all ready and happy to serve you. 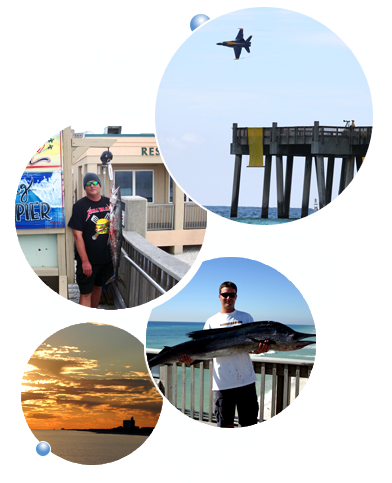 So come join the fun here at the Pensacola Beach Gulf Fishing Pier for a great day of fishing and observation. Enjoy the great establishments we have here at the pier adding to your dining and shopping agenda. We look forward to having you aboard!